A timeless stone fireplace surround is the pride of any beautifully adorned great room. Perfect to enjoy and cuddle up with your partner during those notoriously bitter Minnesota and Wisconsin winters. You yearn to relax, and melt away the evening chills in the glow of your own custom stone fireplace. Visit our Fireplace Gallery for some beautiful pictures of stone fireplaces we’ve designed for our clients. 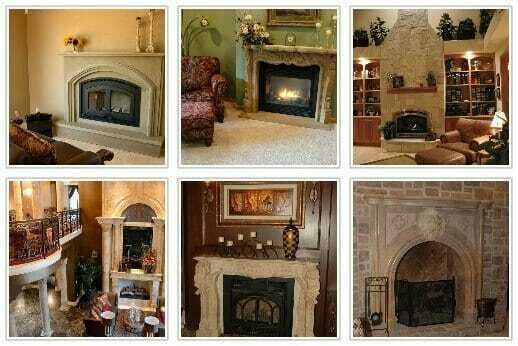 Fireplace photos will help you; especially if you dont know what fireplace style you want. Looking at pictures of fireplace designs youll soon discover what you like and dislike. Weve got hundreds of pictures of fireplace surrounds and stone fireplace pictures for you to look at here. If you like the floor-to-ceiling look, this photo gallery will show you dozens of pictures of fireplace over-mantels. There is a plethora of fireplace pictures available on the Internet, but very few will offer you complete customization of any design. Second, identify the type of fireplace unit, your source of heat. Third, determine what size fireplace unit you would like. This varies based on manufacturer but typically range from 32 to over 42 wide by 28 to over 36 tall. ?Fourth, make note of room dimensions that your fireplace will sit in. Things to consider are ceiling height and wall width. Also, make note of any possible obstacles such as windows or cabinetry that may limit the width of you stone fireplace mantel, or marble fireplace surround. Fifth, specify what material or color you would like your fireplace to be. Stone fireplaces are very unique in that they are available in a virtually unlimited spectrum of natural colors to complement any decor. Contact us if you need guidance. Now all thats left after completing these 5 steps is to contact us and speak with one of our talented designers to put all these pieces together for you to create your own unique, custom stone fireplace design. Call toll free 1-866-759-1920 or email [email protected] CarvedStoneCreations.com for personalized assistance. Get started designing your stone fireplace today; download our free design guide.